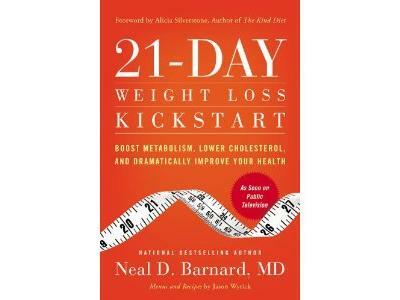 Best-Selling Author Neal Barnard Discusses the "21-Day Weight Loss Kickstart"
Following the success of his 2010 21-Day Vegan Kickstart online program, physician Neal Barnard (Breaking the Food Seduction; Foods That Fight Pain, etc.) reworks his material for comprehensive lifestyle change. Day by day, Barnard discusses vegan choices, benefits and challenges. Readers learn to substitute vegetables, fruits, legumes, whole grains, and plant-based protein for fatty animal products (meat, dairy, fish) and sugary fare; eat vegan in social situations and while traveling; promote weight loss, energy and sleep; relieve pain; prevent or reverse diabetes, heart disease and some cancers; and create meals that, Barnard contends, fulfill all nutritional requirements. Home food preparation is key, but Barnard offers options for dining at restaurants and fast-food chains and using convenience foods. While readers must commit to food shopping and cooking, Barnard motivates with promises of quick results and insights from medical professionals and celebrities, and tempts with generous breakfasts (pancakes with maple syrup; burritos with potatoes and spinach), easy desserts (a delicious chocolate cake), and assurances of weight loss without deprivation, calorie counts, and exercise routines. Dr. Barnard joins us on today's show.